If you are in Africa and you want to buy and sell of Taucoin, Bitcoin, Credit, EOS, Ethereum, XRP and Stellar etc. 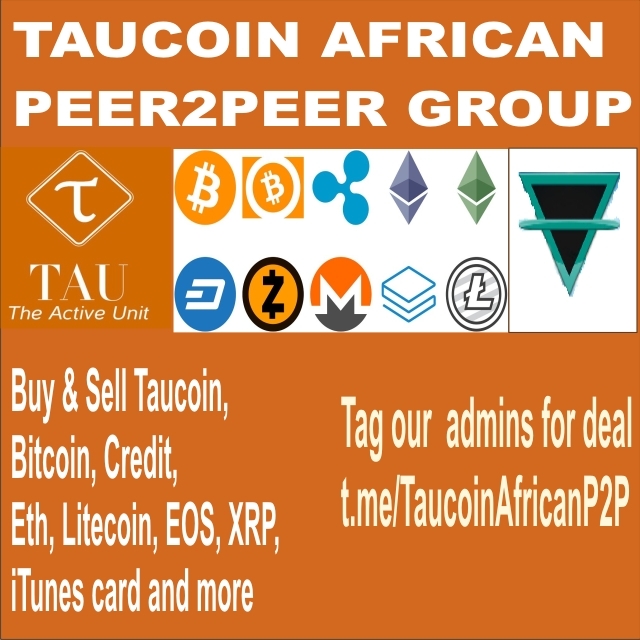 Taucoin African P2P Group is a peer to peer escrow/platform that allows for trading of Taucoin, Bitcoin and other cryptocurrecies between buyers and sellers through a tested and trusted intermediary called Admins. In our P2P group, all transactions are quick, fast, transparent and secured. A coin owner(Seller) advertises his/her cryptocurrency stating its price, while the person who needs the coin(Buyer) negotiates/bargains, agrees with the seller and then trading starts through a trustworthy admin/escrow coordinator. If you want to buy you will drop how many Taucoins you needed, the rate you want to buy it and which method of payment like Bitcoin, Naira, EOS, ETH, Credit or Tron etc. you want to use to pay the seller. For example: 50,000 Taucoin is needed at your rate and Bitcoin, Naira, EOS, ETH, Credit or Tron etc. etc. For method of payment. If you want to sell your Taucoin you will drop how many Taucoins you want to sell, the rate you want to sell it and which method of payment like Bitcoin, Naira, EOS, ETH, Credit or Tron etc. you want to accept from the buyer. For example: 50,000 Taucoin is available for sale at your rate and Bitcoin, Naira, EOS, ETH, Credit or Tron etc. etc. For method of payment. First 50 people that join our Taucoin African P2P Group will get 100 Taucoins from me (@folaross) just chat me on telegram with your Taucoin wallet address. -After negotiations/agreements between a buyer and a seller. -Admin releases money to the seller upon 1/3 confirmation of coin by the buyer. -Seller must send complete coin to avoid complain or delay in payment of the coin sent. Thank you for your joining us. Enjoy your trading.